Clayton Bewley Bauer is a Kentucky kid. He grows up like a weed, hardy, smart — but not too smart — and is able to thrive in the thinnest of circumstances. He's not going to be stuck in his hometown of Owensboro forever, not when it's the late sixties and a guy like Roads swings into town. Give Clay some jazz, some drugs, a bit of poetry and that weed is going to start to turn into a wildflower. The language that Clay grows up in, the words that swirl his being into yours, his world into yours are going to change you and your vision of this world. 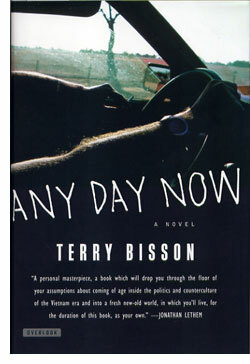 With 'Any Day Now,' Terry Bisson brings back prose as an addictive, mind-altering substance. Tuck into 'Any Day Now' and you'll quickly get the Beat that Bisson is writing to. Sure, he harkens back to the greats, but Bisson's spin on the bildungsroman is ultimately more original than the reader can possibly expect. First and foremost, as a reader, you're going to find prose that seems written to spec for the speed of your mind, at whatever rate your wheels may turn. Bisson tells his story in succinct spots of terse, pixilated prose that is endearing and propulsive. It's hard to stop reading, because Bisson has the chops to make reading intensely pleasurable. The stream-of-style consciousness (not a typo on my part!) skitters through Clay's life in a manner that makes readers feel as if we're getting the highly-condensed (and intensed [again, not a typo!]) version of events, the movie trailer of a life that is better than the life itself. And what a life, given life by Clay, a nice kid who hops, skips, hitch-hikes, jumps his way to New York and "EmCee," that is Mary Claire, a dark star who exerts a gravitation force greater than even she can bear. The upshot of EmCee-meets-Clay is Clay's next journey to a commune where all is not as we know it should be. Bisson excels at creating a cast of characters who are are funny, charming, damaged, dangerous, but always fun to read about. Every turn is a turn to someone you want to be with, even if you know they're bad for you, or Clay. We all know how much we like those are bad for us, and Bisson makes this all a blast for the readers. The secret kernel at the heart of this flowering plant is the thriller-style plot that unfolds at the edges of these rather oblivious characters' perceptions. Here's where the novel becomes really fun, as Bisson deftly manages to duck, side-step (literally) and weave around our expectations of what can happen in this world. Great things are happening outside the commune, and they might actually threaten what's happening within as well. They'll certainly threaten your ability to put down the book. You might like to think that it is good to know your world, to know that it is stable, and that events won't diverge from the script you might want to write. But Bisson knows that the best scripts evade our expectations and create new hopes, foment new nightmares. You might go to sleep in one world and wake up in another; you might find that history has, in spite of your certainties, turned on a dime. 'Any Day Now' turns your reading world on a dime, then does so again. You will go to sleep in one world and wake up in another. Good luck. You may find that you can thrive in a world you never expected to exist.